Your sales process will define your sales results. Period. It will either be an engine of growth that fuels your success or an anchor of doom that will drag down even the best marketing campaigns and ad buys. Every company has a sales process that runs day in and day out, it's merely a question of whether or not it's a good one. Estimated Time: This lesson should take approximately 13 minutes. Don't skip this step. It's the most important. It is critical to examine your baseline. If you've never done this you may find some surprises. It's amazing how much apathy and disorganization can get tucked away when no one's looking. Look back at your last 15 leads and trace the steps you or your agents took with each lead. Be specific with what happened at each step. How were you notified about those leads? How and when were they distributed? Were those leads called or emailed first? How long after they came in? What questions were asked in the initial conversation? How were they answered? What percentage of those leads were you able to get in touch with? Did you make contact on the 1st call, 2nd call, etc.? How did the agent assigned to each lead coordinate follow up? Did they use their memory or a reminder system? What files or documents were sent to the lead? At what step of the process were those document sent out? Of the leads that you lost, what was the specific reason? Of the leads you couldn't reach, how many times was each lead contacted via phone? Via email? Very few companies do this kind of auditing. 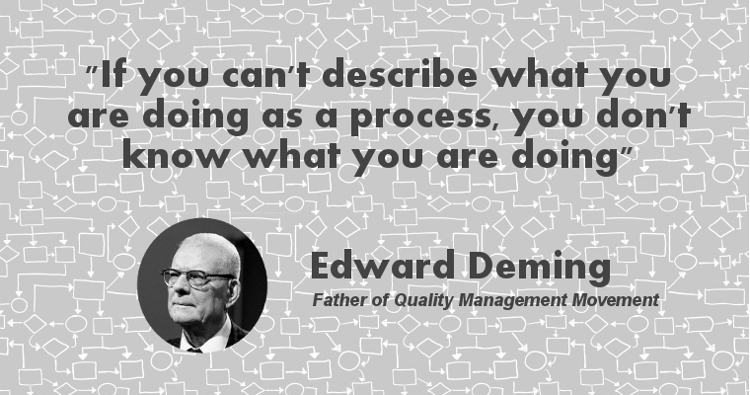 With a clearer picture of the status quo, you can then use that as a benchmark against which to make improvements and measure their impact. If you don't have answers to most of these questions, that's ok, but realize that in the inability to answer is a commentary on how well well your current process is being managed. Takeaway You have to understand what the baseline is before you can have any hope of improving it. Don't skip it. Here's a well laid out plan that leaves nothing to chance. After the initial 60 minutes a new process would take over for the next stage of follow up. Next we start from from the ground up and build your new sales process. Start by laying out the sales stages. 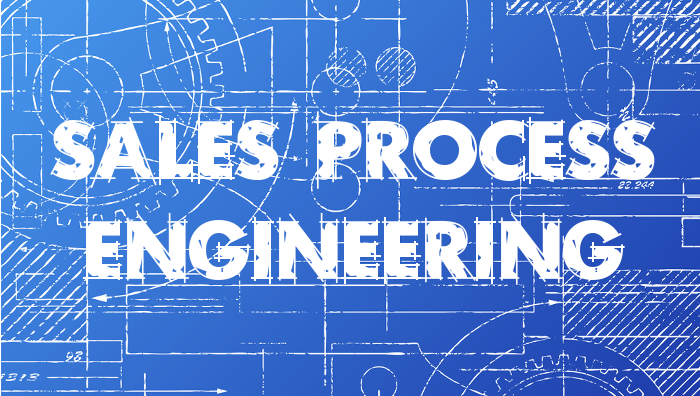 Sales stages are basically the milestones that leads go through in your sales process. The exact stages and stage names will vary from company to company but the basic idea is the same. Leads are either in an open stage, meaning they're still being worked, or in a closed stage, meaning they've reached some kind of definitive conclusion such as won or lost. As an example, here are the default sales stages in LeadSimple, which can be customized. Once you've defined these sales stages, they become the buckets that all sales activities fall into. Each stage has its own set of actions to be completed to move to the next stage. Takeaway No matter which lead, when it was last touched, or who was handling it; anyone in the company should be able to immediately look at the stage and know exactly what has happened and what needs to be done next. 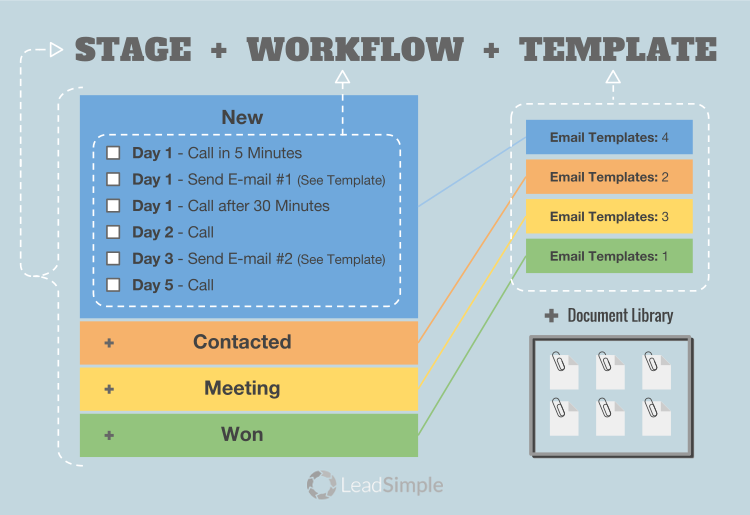 By creating a specific list of steps for each stage, you wind up with a clear work flow that anyone in the company can use to manage and follow up with leads. Good work-flows are your battle plan for sales, they equip every team member with a proven plan. It all comes together when we combine the activities in each stage along with stage-specific templates and documents to generate complete pre-baked sales experience than any agent can administer. Here's a graphic that helps visualize what this looks like in practice. Keep in mind there's a ton of leeway in how you implement this. What's important is that the steps are specific and easily understood by the people using it. Takeaway Build a blue print any agent can use by tying together a work flow of sales activities in each stage of the process with supporting aides such as call scripts, email templates and attachment. The key is to focus on improving a single part of the process. 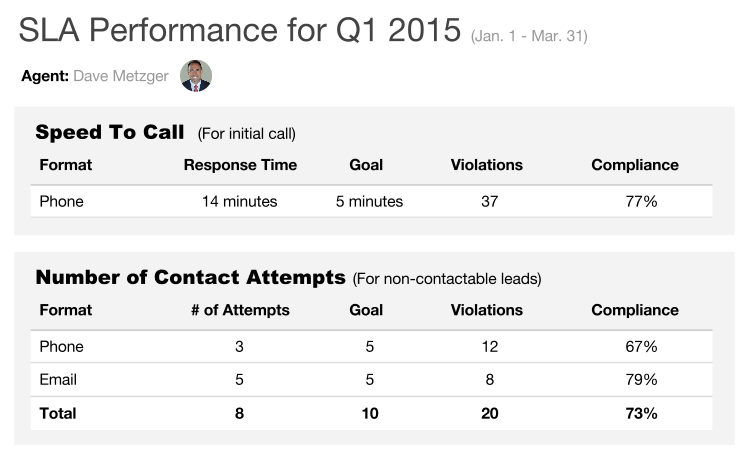 Contacting new leads - Focus on driving down initial lead response times. Start by implementing tracking and then move to add automation. Getting more meetings scheduled - Create one significant piece of sales collateral and then embed it in your sales process so every prospect sees it. This could be a one page brochure, a few video testimonials or an eBook on what to look for in a property manager. Getting meetings completed - Start sending out automated meeting reminders via AppointmentReminder.org. Making the close - Test a new promotional offer and track close rates for the people you offer it to vs. those you don't. 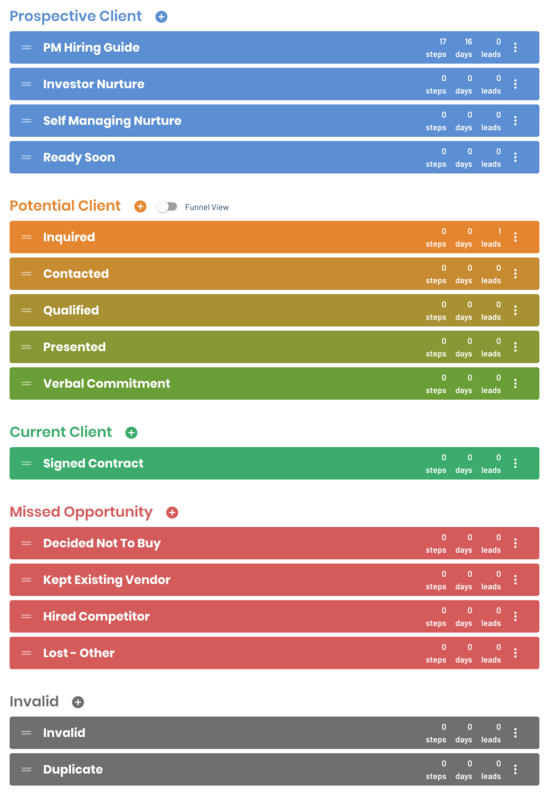 Loss tracking - Start tracking a specific reason for every lost deal and tally them up over time to identify common patterns you may be able to fix. Nurturing long term leads - Create a long term follow up schedule and nurturing campaign. These are just a few examples, each idea is a project in and of itself that would require focus and has the potential to yield significant ROI. Wherever you start, the place to finish is always going back and measuring the results. Target a specific segment of your sales process and then go back and see if it actually moved the needle once you've processed a couple months' leads under the new process. Takeaway Go all in on one specific area of your sales process and then go back to confirm weather or not it actually made a difference. If it did, rejoice and move on. If it didn't ask why, make adjustments, and try again. SLA stands for Service Level Agreement. It's basically an internal agreement that specifies how leads will be handled. It's a common tool used by professional sales teams to define and enforce what is, and is not, acceptable when it comes to handling leads. The two most common components are a time limit for how quickly new leads should be responded to, and requiring a specific number of follow up attempts before giving up. 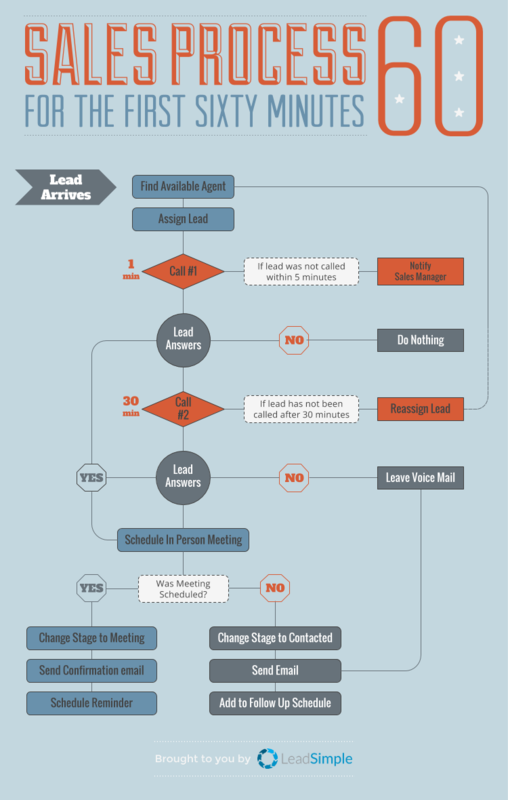 Speed to call - New leads must be called within 5 minutes after being received. Follow up - New leads must be called 5 times within 14 days before being marked lost. The one big caveat is that there's no point in having an SLA unless you plan to track and enforce it. We've talked previously about ways to track phone and email communications, and that's going to be the backbone for measuring performance against your SLA. The goal is adding accountability, so here are a few ways to help do that with an SLA. Talk about your SLA - People tend to respect what you inspect as the saying goes. Simply reviewing performance stats with agents will make them much more aware of the benchmark they need to hit. 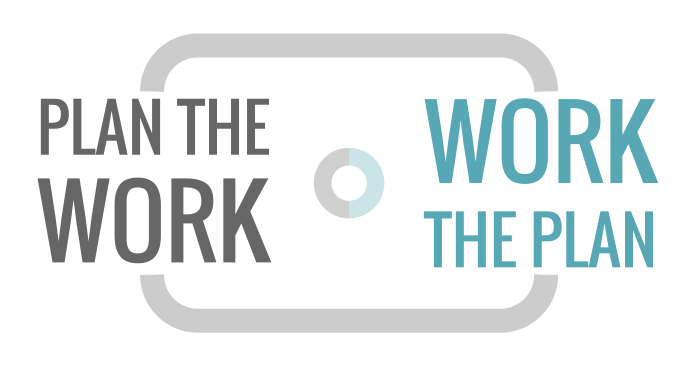 Send out a weekly or monthly email with everyone's stats and recognize top performers. Display SLA performance in a public place - Whether it be a white board, large note pad or spare computer monitor, all that matters is that people are aware of it and have the chance to see how they are doing and course correct as needed. Displaying it in public also encourages competition. Reassign leads based on SLA violations - When agents are neglecting leads, those leads should be reassigned to another agent who is more willing and / or able to give that lead the attention it needs. Having clear expectations via your SLA makes this so much easier to do and once agents understand the system they are empowered to either shape up or ship out. Takeaway A service level agreement (SLA) is set of standards that agents are held to for things like lead response time and number of follow up attempts. It's what keeps everyone on track. Stay the course. Your process is more important than the short term outcomes. Outcomes are what happened. They tell you nothing about why it happened. For example, the fact someone wins the lottery doesn't indicate that person is savvy about making financial invests or generating wealth. 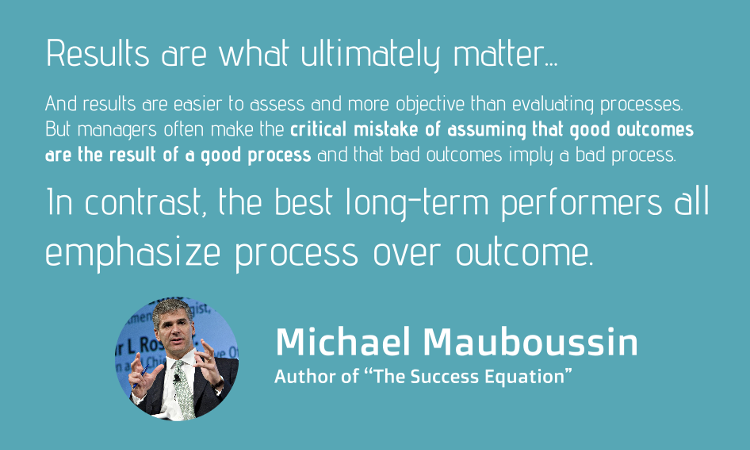 Your process on the other hand is a specific, repeatable practice that drives outcomes. It's something you can control and modify, even when in the short term the results aren't exactly what you had hoped for. Everyone wants a quick fix, but short term results can be a huge distraction for those that lack the patience to see investments in their process all the way through. I see this all the time when companies are vetting new marketing channels. The fact the last 3 leads didn't immediately convert doesn't mean the lead source they came from is bogus. The fact a given mailer campaign generated zero results doesn't mean mailers as a whole don't work. Be realistic about how much time a given change needs to take effect and always ask WHY when new initiatives fail. Measure success based on your latest short term results. 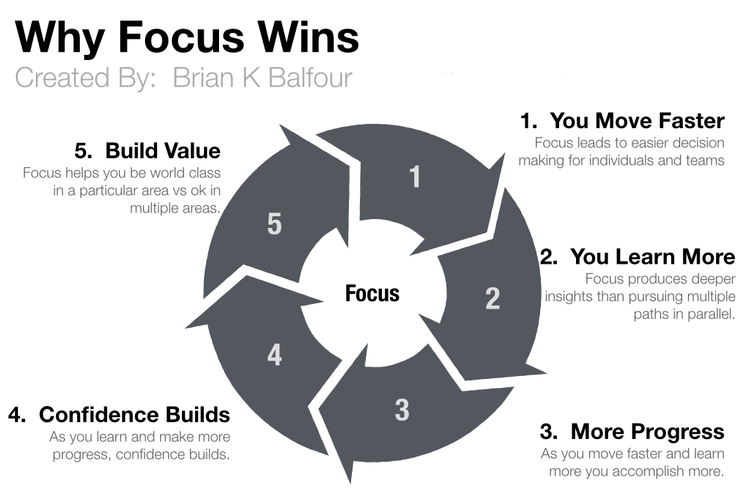 Focus on refining the actions that you believe will lead to the long-term results you want. You can either focus on the process or the outcome. Most people focus on outcomes and quit before they ever see real progress. Don't be that guy. Takeaway Don't fall into the trap of focusing on short term results when you're trying to implement long term changes. Stay focused on improving your process over the long term and give those changes enough time to take effect. Try LeadSimple FREE for 14-days or schedule a demo.